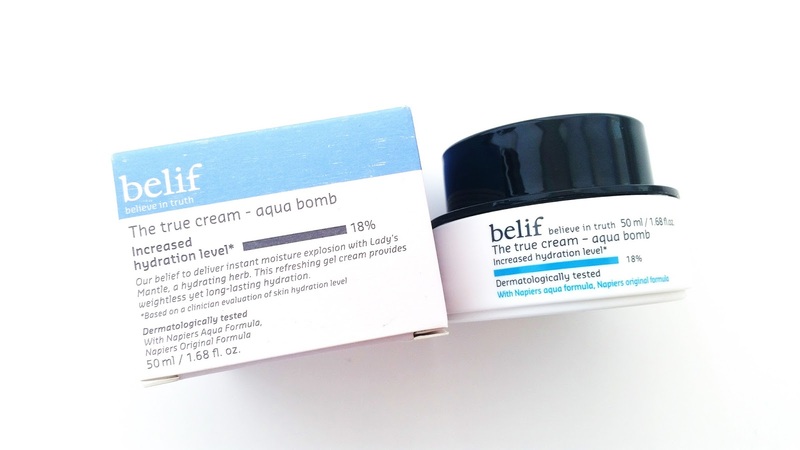 Product Description: Belif The True Cream Aqua Bomb is a lightweight gel cream. It's formulated with a blend of apothecary herbs, which includes antioxidant rich lady's mantle. This formula provides intense hydration, improves skin elasticity, minimizes the appearance of pores, and helps to neutralize skin damaging free radicals. It will leave the skin healthy, moisturized, soft, smooth, and supple. To Use: Use this as the moisturizer in your skincare routine. This gel cream can be used morning and night. Ingredients: Water, Dipropylene Glycol, Glycerin, Methl Trimethicone, Alcohol Denat, Dimethicone, Cyclopentasiloxane, 1,2-Hexanediol, Malakite Extract, Caprylic/Capric Triglyceride, Pentaerythrityl Tetraethylhexanoate, PEG/PPG/Polybutylene Glycol-8/5/3 Glycerin, Alchemilla Vulgaris Leaf Extract, Equisetum Arvense Leaf Extract, Stellaria Media (Chickweed) Extract, Urtica Dioica (Nettle) Leaf Extract, Plantago Lanceolata Leaf Extract, Avena Sativa (Oat) Kernel Extract, Calendula Officinalis Flower Extract, Nepeta Cataria Extract, Rubus Idaeus (Raspberry) Leaf Extract, Baptisia Tinctoria Root Extract, Dimethiconol, Polymethylsilsesquioxane, Sodium Acrylate/Acryloyldimethyltaurate/Dimethylacrylamide Crosspolymer, Isohexadecane, Polysorbate 60, Ceramide 3, Cholesterol, Butyrospermum Parkii (Shea) Butter, Phenl Trimethicone, Pentaerythrityl Tetraisostearate, Panthenol, Squalane, Triethylhexanoin, Macadamia Ternifolia Seed Oil, PEG-150, PEG-40 Hydrogenated Castor Oil, Acrylates/C10-30 Alkyl Acrylate Crosspolymer, C14-22 Alcohols, Arachidyl Glucoside, Hydrogenated Lecithin, PEG-100 Stearate, Stearic Acid, Glyceryl Stearate, Carbomer, Tromethamine, Trisodium EDTA, Fragrance+, Citronellol, Limonene, Citral, Geraniol, Linalool. Packaging: The Aqua Bomb comes in a sturdy plastic container and an outer box package as seen above. The outer package has a lot of information (in English) about the product and it includes the full ingredient list as well. The gel cream is stored in an easy to use container with a twist off lid. Scent: A citrus-herbal mix of scents. It's medium to mild but dissipates quickly after application. To me, the scent is really calming. Color: Light blue in color, as seen in the picture below. It's really opaque and doesn't leave behind any color once applied to the skin. Texture: Gel like cream. It's light and refreshing. Easy to apply and absorbs fast as well. Michelle's Thoughts: As you can see, I've been using this Aqua Bomb moisturizer for a while now. I'm 2/3 way through it and it won't take long before I clear the container. I was particular cautious with this product, as I am with any products that contains alcohol denat. (It's 5th on the list). From past experiences, I can be sensitive to products with alcohol denat., especially if they are one of the first 3 ingredients. Being 5th on the list means there's a good chance that it won't irritate my skin, but it's always good to be cautious. So whenever I come across a product with alcohol denat. as an ingredient, I always do a thorough patch test. 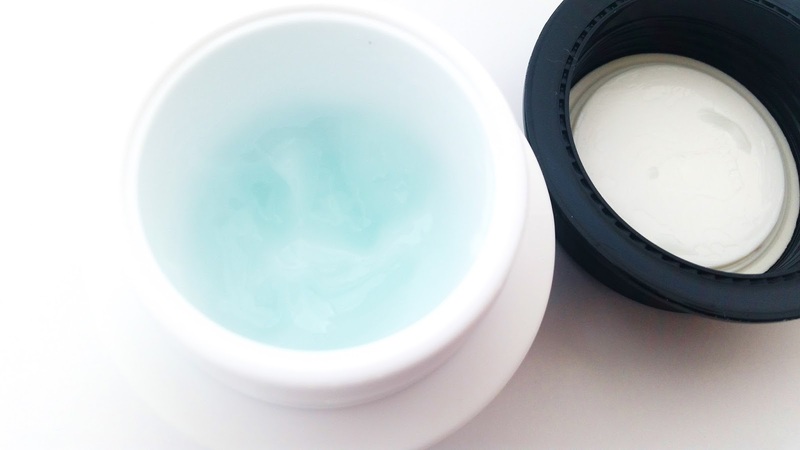 As expected, this Aqua Bomb gel cream didn't irritate my skin, which is great. Its citrus herbal scent also covers the alcohol scent, which is another plus. I've been using this gel cream morning and night and it's a hydrating yet lightweight gel cream. I like to apply a bit more on my combination areas and a bit less on my oily T-zone, as I've found that if I apply too much on my T-zone it can cause excess sebum. However, after finding out the perfect ratio I rarely run into any issues. I love how easy it is to apply and use this gel cream. Its citrus herbal scent is calming and relaxing. This gel cream contains nourishing ingredients to provide long term care for the skin and it also soothes the skin as well. Leaving my skin feeling soft and plump. Since I've already found my HG moisturizer for the cooler months, my current moisturizer hunt is mainly for a good moisturizer for the warmer months. After 2 months of use, I think this is a good moisturizer but it comes with a few issues of its own as well. The biggest issue is its alcohol denat. ingredient. This potential irritant will make this a hit of miss product. While it's lucky that this gel cream doesn't irritate my skin, I'm still iffy on getting this again. It would be awesome if this product doesn't contain alcohol denat., I know I'd for sure purchase then. 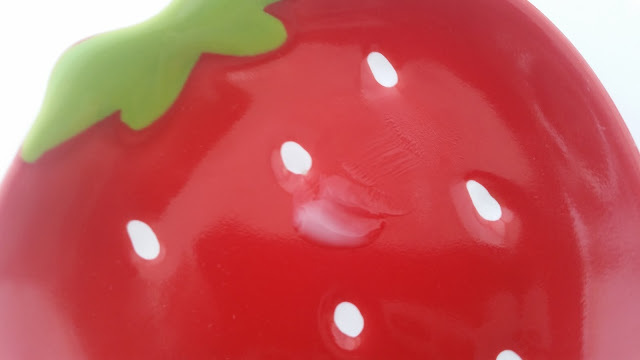 The other issue I've come across with this gel moisturizer is that it doesn't really minimize the appearance of pores, despite what it promises. At least, I've never seen any results of it. Finals Thoughts: I really like this Belif The True Cream - Aqua Bomb and I would love it even more if it takes out its alcohol denat. ingredient. I think that's my only complaint for it and I do hope Belif will update this gel moisturizer with that in mind. I'm also slightly disappointed that it doesn't minimize the appearance of pores as promised. However, overall, this is a pretty good moisturizer for the current season. Would I purchase it in the future? Undecided. If Belif upgrades the product and take out its alcohol denat. ingredient, I'd be happy to purchase it and add it to my moisturizer arsenal. In the meantime, I will be testing out other moisturizers for the warmer months. Do I think this is worth a try? Yes, as long as you don't mind the alcohol denat. ingredient and is looking for a lightweight yet hydrating moisturizer that also offers nourishing, soothing, softening, and plumping effects. This Auqa Bomb moisturizer would be worth the try for you.